Foster a greyhound that has just arrived from the track. CLICK HERE to fill out a foster application and to learn more about fostering. Invest in a 401(Grey) Foster Dog Sponsorship. As a 401(Grey) Investor, you'll be sponsoring a dog awaiting adoption. Your name will appear on our website, adoptables boards and you'll be featured on our Yahoo list. More importantly, your $50 investment will help us help more adoptable hounds. Drive your SUVs or van to help pick up dogs from adoption agencies or transport broken-legged hounds to the veterinary orthopedist in Memphis. Sign up to help at Meet and Greets and special events. Identify a site for a new Meet and Greet and take the lead for its regular occurrence. Train to do home visits and to support new adopters. Pitch in with all manner of clerical tasks, telephone follow-up, proofreading, data input, etc. 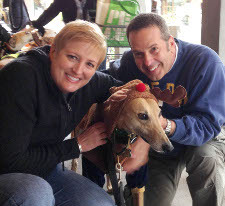 Introduce others to greyhound adoption by taking your hound to animal-friendly events. 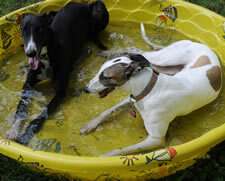 Distribute signs and brochures promoting greyhound adoption at libraries, stores, your work or house of worship. Chair or help plan a special event such as our picnic or Winter Gathering or work at the event by taking a shift at the sign-in table, food table, help with clean up or assist with foster dogs. Learn to trim and Dremel dog nails and provide this service at Meet and Greets and events. Each nail trim nets the group $5 per dog. For more information give us a call at (615) 269-4088 or email us at gpanashville@gmail.com.